This week we have a cabinet card photograph of a little boy. He looks to be about four years old to me. His outfit really caught my eye when I was rummaging through a box of old photos at an antique store. The photographer is a W.J. Huitt from Kane, Illinois. 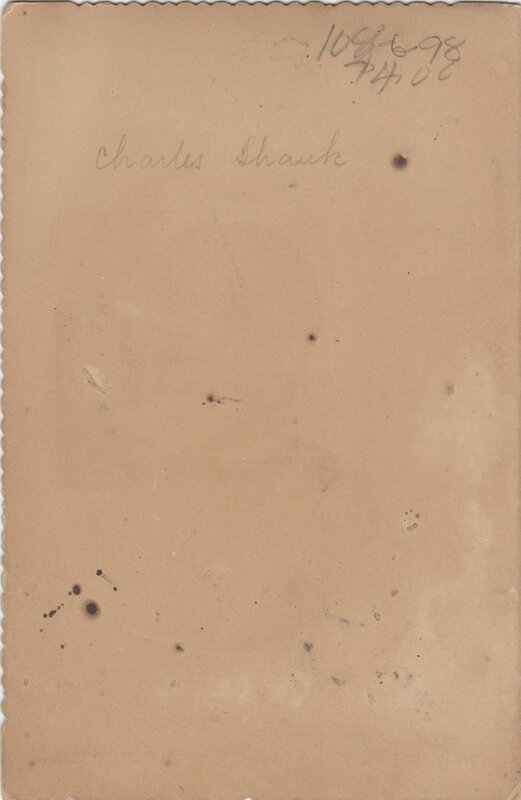 The marking on the back indicates that the boy is a Charles Shauk. That is all I know. I did a very quick preliminary search and nothing obvious came up. There are some “Shauks” in Cook County, IL. I also considered that the name might be “Shawk”. Regardless, there are many leads you could explore if you are interested in learning more. I would love to know what you discover! Please either comment below or send me a message and I will update the post. Here are some questions I have. What sort of hat and outfit is the boy wearing? What do you think, feel, and wonder about as you look at the photograph? Does Charles have any relatives alive today who might like this photo as a family keepsake? During what years did the photographer operate?